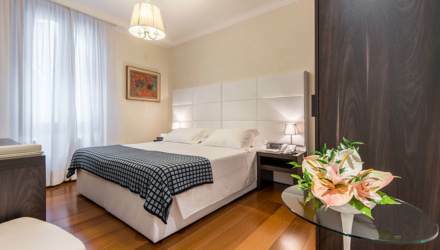 In the heart of the most beautiful Venice, the Bonvecchiati Hotel offers you more than 100 refined rooms where you can stay for a dreamy weekend or an unforgettable vacation in a romantic hotel in Venice. The rooms at the Bonvecchiati Hotel welcome you as only the best historic hotels in Venice can do: classic or revisited style with a modern touch, luxury bathrooms, comfort and services that are a must for the best international 4-star hotels in Venice, all these make the rooms at the Bonvecchiati Hotel a very agreeable place to stay. And there is Venice, as soon as you look out your room window, a magical backdrop for an unforgettable stay. 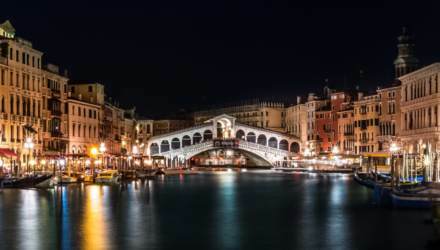 Picturesque roofs and chimneys, characteristic streets and canals, and enchanting Venetian courtyards: all this and many other fascinating aspect can be admired by looking out the window of your romantic hotel room in Venice. 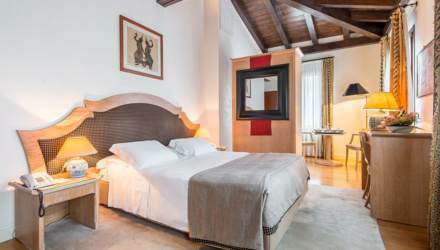 Typical 16/18m2 en suite Venetian style rooms with a view overlooking the internal courtyard. Suitable for two guests (double or twin). Comfortable 18/22m2 en suite, Venetian style or contemporary design rooms with a view of a typical Venetian street or the internal courtyard. Suitable for two guests (double or twin), with the option of an additional single bed. Spacious 22/28 m2 en suite Venetian style or contemporary design rooms. 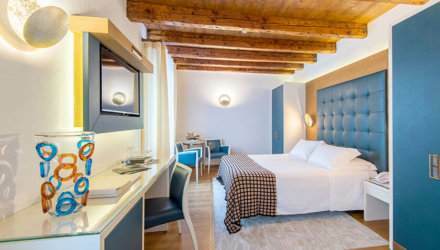 Some rooms have a panoramic view of the city or the Orseolo canal, and are available on request. Suitable for two guests (double or twin), with the option of an additional single bed. Large 35/40m2 en suite contemporary style junior suites that include a bedroom (double or twin), a lounge with double sofabed and bathroom. This is the ideal solution for hosting a maximum of 2 adults and 2 youngsters. Spacious 25/30 m2 room located in a beautiful turn-of-the-century apartment block next to the main hotel building. These contemporary style rooms all have a view over the Orseolo Canal. Free satellite TV, safe and coffee and tea making facilities are available in the rooms at no extra cost.